2016 marks the 58th annual Grammy Awards ceremony conducted by the National Academy of Recording Arts and Sciences. Receiving a Grammy award represents the ultimate accomplishment in recording arts, since it's the only peer-voted award in music. Everyone's heard of child prodigies such as Michael Jackson or Stevie Wonder who became superstars at a young age, but what about artists that pursued a musical education later in life? 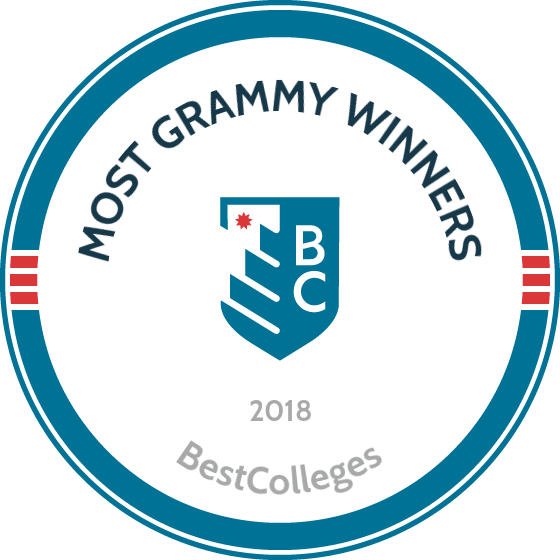 Which colleges have produced the most Grammy winners? There are two kinds of schools featured on our list. Some schools accept only a handful of students and specialize in training musicians and recording engineers, while others offer large, well-funded programs that graduate hundreds of professionals each year. These colleges range from tiny, private conservatories to huge, public universities. Normally, a list of this nature would only count alumni, but in the music business, earning a degree isn't required to make a hit record. The majority of the schools featured boast more than one winner, but some have been lucky enough to graduate a single artist who won multiple awards. Due to the nature of the Grammy awards, many people can share a single award, especially those in the classical and jazz categories. In this case, the primary composer, conductor, or musician is credited with the award. Some schools listed awards won by members of large orchestras (e.g., second oboe), but these were not counted. If several members of the same band went to the same school (Take 6, Pat Metheny Group, etc. ), it only counted as one award to ensure both bands and solo artists were counted the same. Some artists may have attended more than one school on this list, but the school where they attended the longest or graduated from gets the credit. For example, the legendary Leonard Bernstein is counted twice, once for his undergraduate work at Harvard and once for his Graduate work at Curtis Institute. Though founded by Lawrence Berk as the Schillinger House in 1945, by 1970 the school became Berklee College of Music, named after Berk’s son, Lee Eliot Berk. Admissions require both live auditions and interviews, with acceptance determined by perceived talent and potential. Just under 4,500 students currently attend the school. With 27 awards to his name, Quincy Jones sits atop the list of over 100 Berklee students who have earned over 250 awards. This performing arts school was founded in 1905 as the Institute of Musical Art, but now hosts dance and drama divisions as well. It’s a small, highly selective school with fewer than 900 students in its college division. Pianist Van Cliburn was a winner in 1958 at the first Grammy Awards, earning the first ever award for Best Classical Performance. Since then, over 100 more Grammys have been awarded to Juilliard students. UCLA hosts the Herb Alpert School of Music, and just under 500 music students are enrolled in the program. With seven undergraduate and graduate degree programs and two undergraduate minors, UCLA covers music from the recording industry to performance to ethnomusicology. John Williams, composer of the iconic film score for Star Wars, Jaws, and many other movies leads the UCLA alumni winners with 22 GRAMMYs. Fellow film composer James Horner, singer-songwriter Randy Newman, and Anthony Kiedis from the Red Hot Chili Peppers are also Bruins who have taken home Grammy awards. The first music course at Harvard was offered in 1845; it’s no surprise this prestigious university is featured prominently on the list. Yo-Yo Ma first attended Juilliard but left for Harvard, and Leonard Bernstein did his undergrad work there. Bonnie Raitt, who has won 10 Grammys, attended Radcliffe College, which was then an all-female school associated with Harvard. The Thornton School of Music at the University of Southern California is the longest continually-operated cultural institution in Los Angeles, offering musical education since 1884. USC boasts an incredibly diverse list of winners, from Herb Alpert, a nine-time winner, who played in USC’s Marching Band in the 1950s, to producer Rob Cavallo, opera singer Nmon Ford, and pop artist Macy Gray. Flea from the Red Hot Chili Peppers (Michael Balzary), who also founded the nonprofit Silverlake Conservatory of Music, enrolled in music theory classes in 2008; the band’s seven Grammys are included in this total. In the mid-to-late 1960s, Art Garfunkel of Simon and Garfunkel pursued a master’s in mathematics from Columbia, where he’d already earned a BA in art history. Garfunkel took classes but stopped short of a doctorate in mathematics education. R&B singer Lauryn Hill, who scored Grammys with the Fugees and as a solo artist, and Alicia Keys both attended Columbia. Guitarist Pat Metheny, who has won 20 Grammy awards, attended the University of Miami for a short period of time in 1972, but was almost immediately offered a teaching position. Several members of the Pat Metheny Group also attended the university. Gloria Estefan, winner of seven Grammys, graduated from Miami in 1979. Bandleader Bruce Hornsby and singer Enrique Iglesias are the other two award-winning Miami alumni. The University of North Texas College of Music is one of the oldest and largest schools of music in the United States. It currently offers 19 bachelor’s, master’s, and doctoral music degrees. North Texas boasts a slew of well-known alumni, with Norah Jones’s nine awards (out of 16 nominations) leading the way. Former Eagles singer-songwriter Don Henley and singers Roy Orbison and Meat Loaf (Michael Lee Aday) also attended North Texas. NYU Grammy winners span the half-century from Evelyn Lear in 1966 to 2015 winners Lady Gaga (Stefani Germanotta) and the duo A Great Big World. Singer-Songwriters Melissa Manchester and Carole Bayer Sager attended NYU in the 1970s. Producer Rick Rubin (Beastie Boys, Run-DMC, Johnny Cash, etc.) got his start as an NYU student when he and Russell Simmons founded Def Jam Records in 1984. Music producer Mark Ronson won a Grammy for his work with Amy Winehouse. The University of Scranton is a small, private Jesuit liberal arts school that makes this list based on one artist—the polka master Jimmy Sturr. Starting in the 1960s, Sturr has recorded over 100 polka albums. In 1985, the Recording Academy added a new category for Best Polka Album and Sturr kicked off an amazing run of six straight awards in 1986.